Pak Nak : It all began with two moms, two cups of tea, two husbands, three children, two cats, one dog and one dream: let's start a business! After more discussion, much more tea, and many hours consulting with our "expert" children on what kids would use and love, PakNak ® was born. From there, we set out to create ginormous fun, one backpack at a time. Our Naks are 3D, rubbery, interchangeable and are super easy to attach to surfaces (with no work or hassle for mom and dad). We knew self-adhesive, flexible, weatherproof designs were crucial to making Naks work. In the early days, we experienced what we now know many startups go through – one day we were plotting certain world conquest, the next we wondered what on earth we were thinking. 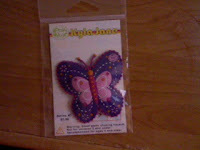 I received the butter fly Pak Nak in colors pink and purple. They are such a cute invention. You peel them, stick them and you are good to go! Pak Naks come in different designs such as butterfly, lady bug, turtle, flowers and more.. You can put them on your kids lunch pales, backpacks, hats, and more! The possibilities are endless! they are soft and flexable so they won't wear and tear. PakNaks are fun soft rubbery 3-D decorations for kids (and adults too!) to personalize all of their stuff. Backpacks, lunchbags, headbands, computer bags, household items, the list is only limited by your imagination. They are not stickers, the backing have velcro so when your child or you are bored with one you can place it with a different one and switch them out. How fun is that! Pak naks are so versitile you can put them on lamps, lamp shades, or even on scrap books. There are no pins so you won't leave holes. Your kids friends will be jealous and they will want one too! Pak Nak. ♥ I receive no monetary compensation for this review. I was provided a Pak Nak to try and give my honest opinion.